US health officials are monitoring 10 quarantined people who had contact with a Liberian man infected by the deadly Ebola virus. The individuals are being checked regularly as medical officials play down the risk of an outbreak. The 10 individuals are considered to be at ‘high risk,’ and are being checked at regular intervals for symptoms of the disease that has already killed thousands of people in West Africa. Another 50 people who had indirect contact with Thomas Eric Duncan, the infected visitor who entered the United States from Liberia on September 19, are under daily observation, Dr. David Lakey, commissioner of the Texas Department of State Health Services, told Reuters. Initially the authorities identified 100 people who had any kind of contact with Duncan and risked exposure to the deadly virus. In Washington, government officials were pressed by reporters as to how Duncan was able to enter the territory of the United States from Liberia, one of the hardest hit of three West African countries where the Ebola virus has killed an estimated 3, 439 people, according to the latest figures released by the World Health Organization. "There were things that did not go the way they should have in Dallas, but there were a lot of things that went right and are going right," Dr. Anthony Fauci, a director at the National Institutes of Health, told reporters at a White House press conference. "So although certainly it was rocky" in terms of how people perceived the response, "the reason I said there wouldn't be an outbreak is because of what is going on right now," he said. Fauci attempted to downplay fears that there would be another Ebola case in the United States, saying that the preventive actions being undertaken by health officials "would make it extraordinarily unlikely that we would have an outbreak." Symptoms of the Ebola virus, which has hit the West African countries of Liberia, Sierra Leone and Guinea, include fever, vomiting and diarrhea. The disease is contagious and is acquired through contact with bodily fluids such as blood or saliva. During Friday’s news conference, White House adviser Lisa Monaco was asked whether President Barack Obama would impose a travel ban on West African countries, as some public officials have demanded. "Right now we believe those types of steps actually impede the response," Monaco said. 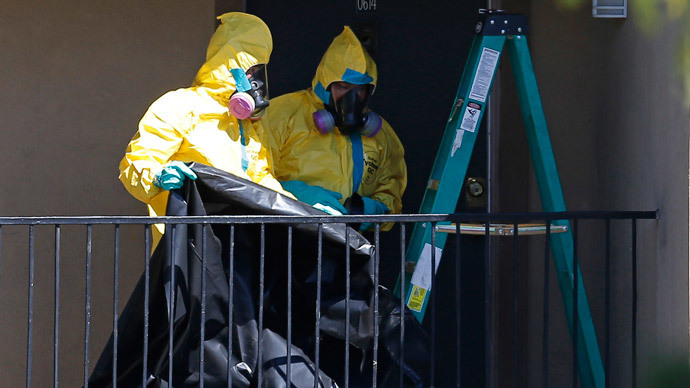 A hazardous materials cleanup crew has been working to decontaminate the Dallas apartment where Duncan had been residing before he was admitted to the hospital almost a week ago. Four family members of Duncan who were quarantined in the apartment have been relocated to an undisclosed location, said Sana Syed, the public information officer for the City of Dallas. Meanwhile, news of another possible Ebola-positive patient has turned up at the nation's capital. On Friday, Howard University Hospital in Washington, DC, announced it was caring for a patient with possible Ebola symptoms who had recently traveled from Nigeria. "In an abundance of caution, we have activated the appropriate infection control protocols, including isolating the patient," said hospital spokesperson Kerry-Ann Hamilton in a statement. The US House Appropriations Committee has set an October 17 deadline for the Obama administration to provide details as to how it is working to protect the mainland from an outbreak. NBC News said on Thursday that one of its freelance cameramen had contracted Ebola in Liberia, becoming the fifth American to be diagnosed outside of the US with the disease.